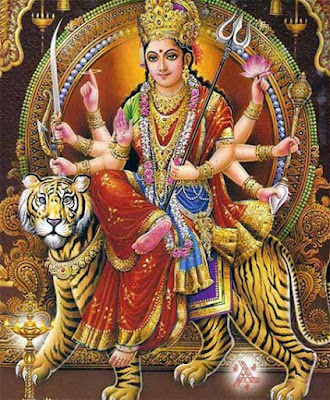 Many people want to know the story of the birth or origin of Goddess Durga in Hindu scriptures. It must be noted that Goddess Durga is the one without birth or death. Only She exists – all animate and inanimate beings are like bubbles in ocean. Goddess Durga appeared in a form (which is wrongly called as birth or origin) to help his devotees. Mahishasura acquired innumerable power through boons and defeated the gods and the demons. He attacked the heaven and captured it and made ‘devas’ his slaves. He proclaimed that he is now Indra – the lord of the gods. The gods led by Brahma approached Vishnu and Shiva and appraised them of the situation. Hair appeared from the energy of Yamraj - god of death. Ears appeared from the energy of Vayu.